Downsizing makes sense on many levels. As your loved ones head into their golden years, they shouldn’t be saddled with maintaining a large family home. Yes, there are a lot of memories associated with the place but unless the family is still living there it might be better to pass a big home to a new family. That way your parents or grandparents won’t have to contend with home repairs, security and high utility bills. Essentially, downsizing means taking what you really need to live with and letting go of everything else. Keepsakes and mementos are important to hold onto. The same can be said for the furniture and household goods you use the most often. As for everything else, let Junk King take it away. No one likes to think of themselves as living with junk. However, if you can describe junk as any item that no longer serves a purpose, then it’s clear we’ve all got junk to get rid of. Working with Junk King for your downsizing junk removal task will require you to decide what you want taken away. You don’t have to move anything outside or bring anything up from the basement. Wherever you’ve got the stuff is where the Junk King crew will go. The most work you’ll have to do is pointing to all the things you want taken away. In no time at all, those objects will be lifted and loaded onto the back of the Junk King truck. Don’t think for a moment that everything you’re getting rid of will be dumped into a landfill. You might be finished with sofa, table, chair or bed but there could be plenty of folks who can still use those things. That’s why Junk King has set up relationships with many Denver area charities. We don’t have a problem making extra drop offs to those charities or recycling facilities. Keeping Denver green is good for everyone. The last thing the Junk King crew will do in your home is sweep up behind themselves. It’s this attention to detail that has our customers returning and recommending Junk King all the time. As for pricing, you’ll only be charged a flat fee based on an estimate of how much space your junk will take up on the truck. You’ll know that price before the work starts and there won’t be any add ons. For quality downsizing junk removal, Junk King is the only way to go. This entry was posted in Denver Downsizing Junk Removal Help From Junk King and tagged Downsizing Junk Removal, Junk King, junk removal on October 29, 2014 by Paul Durant. Last updated August 1, 2017 . When was the last time you actually parked your car in your garage? If you’re like most homeowners, picking a house with a two-car garage was a priority. After all, in the brutal Denver winters, keeping your car out on the street is going to be nothing but trouble. Between the snow ploughs and salt trucks, you can rack up some serious damage. Unfortunately, the garage is an easy empty space to turn into a storage locker. It starts out with a wall of boxes. Then a workbench that is quickly overrun with clutter. Before you know, all the unwanted items in your home have been dumped into the garage. In some extreme cases, you can’t even open the garage door for fear of everything spilling out to the driveway. 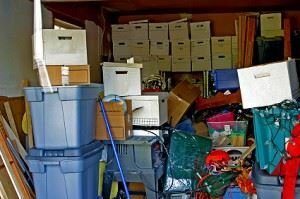 When your garage has become that cluttered, it’s time for a some Junk King garage cleanout effort. When you call Junk King to set up your appointment, they’re going to ask what you’ll be tossing out. They do this not to set the price but to make sure you’ll have all the help you need. If you tell Junk King that you’ve got a “hoarder” situation to deal with, then they’ll send over extra crewmembers to make sure everything can be clear out in a single trip. Keep in mind that you won’t be charged for this extra labor. You’ll only be charged an amount based on volume size. 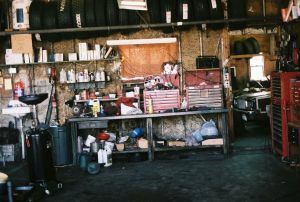 The crew will take a look at your junk and decide if it will use up one-third, one-quarter, one-half or the full truck. You’ll be give a fee based on that amount and it’s not going to change no matter how long it takes to load up or how many movers it will require. Shop around and you’ll see that Junk King offers the most affordable rates in Denver for this type of professional service. After your garage cleanout has been checked off, you can also use that same Junk King crew for a yard cleanout. They can gather up all the fallen leaves, tree branches, bushes and other debris items. It’ a great way to clear out the yard to make way for the upcoming holiday decorations. Set up your garage cleanout appointment with Junk King today and you’ll be parking indoors before you know it! This entry was posted in Denver Garage Cleanout and tagged Garage Cleanout, Junk King, junk removal on October 21, 2014 by Paul Durant. Last updated August 1, 2017 .